Largest Study Of Stroke Patients In Africa Reveals High Rate Of Especially Dangerous Type. Why? : Goats and Soda The largest-ever study of stroke patients in Africa reveals a high rate of a particularly risky type of brain incident. What's the problem? And what's the solution? 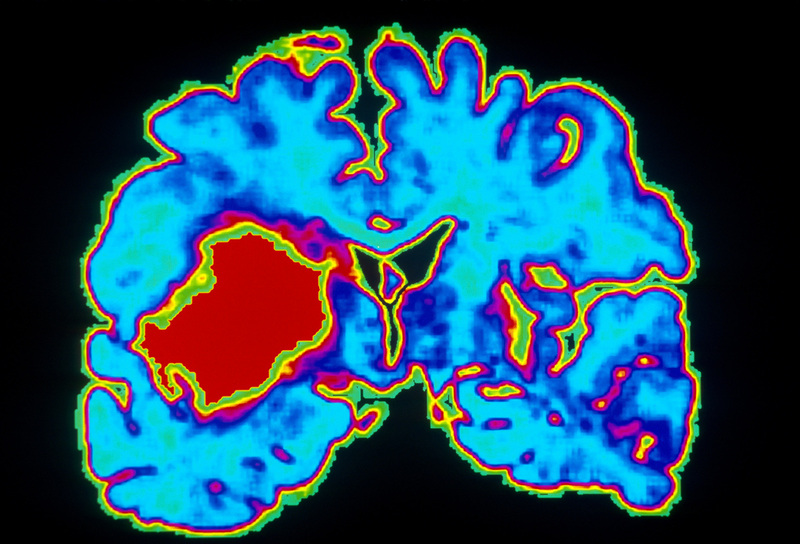 A computer-enhanced scan of a brain shows a hemorrhage due to hypertension. Last April, Fredua Agyemang, a musician in Kumasi, Ghana, was performing onstage at a funeral, which in this country is often a festive affair with hundreds of guests. Suddenly, he began to feel dizzy, then lost consciousness and collapsed. When he woke up three days later, his bandmates broke the news: He had suffered a stroke. Immediately, he thought of another doctor visit eight years earlier, when, at the age of 34, he had been diagnosed with hypertension and prescribed medication to reduce his blood pressure. The medication had given him problems with erectile dysfunction, a common side effect, and he soon stopped taking it regularly. That decision seemed foolish, he recalls. He was having difficulty moving and speaking and knew that he wouldn't be back onstage anytime soon. "I still have weakness," he says, nine months later. "I'm not able to walk well, I can't use my left arm, I can't sing." Doctors found that Agyemang's stroke was hemorrhagic, meaning that a blood vessel in his brain burst from excessive pressure. In the U.S., this type of stroke is rare; nearly 90 percent of strokes in the U.S. are "ischemic," meaning they're caused by a clot or other blockage of a blood vessel in the brain. But according to a new study, the largest-ever of stroke patients in Africa, up to one-third of strokes in this area of the world are hemorrhagic. And while the survival rate for ischemic strokes is around 80 percent, for hemorrhagic strokes the odds of survival are only 50/50. Agyemang is lucky to be alive. Researchers already knew that the overall rate of stroke in Africa is among the world's highest, with around 316 new cases each year per 100,000 people. (The U.S. rate, by comparison, is around 246 new cases per 100,000 people, according to the CDC.) But the study sheds new light on the prevalence of hemorrhagic stroke. "We are seeing way more hemorrhagic stroke [in Africa] than in the West, and we need to understand what's driving this," says Dr. Fred Stephen Sarfo, a neurologist at the Kwame Nkrumah University of Science and Technology in Kumasi, who led the Ghana side of the study. "It's a huge and neglected burden." Hemorrhagic stroke is of particular concern because it is so likely to be fatal, Sarfo says. But this type of stroke also highlights the danger of another health issue that is increasingly widespread in Africa: hypertension. The study found that hypertension was to blame in more than 90 percent of hemorrhagic stroke cases. The link between hypertension and hemorrhagic stroke goes a long way toward explaining why the latter has become such a problem. Cardiovascular problems like hypertension were once rare in Africa, but today, the continent has the world's highest rate of high blood pressure, afflicting nearly 50 percent of the population, according to the World Health Organization. Epidemiologists have found that as African countries develop and become more urban, the profile of disease is rapidly changing. Infectious diseases like malaria, tuberculosis and HIV, while still major problems, are being joined by noncommunicable, long-term diseases associated with a more sedentary lifestyle and increased consumption of tobacco and processed food. WHO predicts that cases of such diseases, especially cancer and heart and respiratory disease, will increase 27 percent in Africa in the next 10 years, leading to an additional 28 million deaths and that by 2030, deaths from such diseases will exceed those from infectious disease and other traditional health problems. The number of people in Africa with hypertension is projected to rise from 80 million in 2000 to 150 million by 2025. Still, the general public in Africa is largely unfamiliar with cardiovascular disease, and people rarely seek the kind of regular check-ups that can identify high blood pressure, says Dr. Prebo Barango, a noncommunicable disease specialist for the WHO in Zimbabwe. Barango said that WHO surveys have shown that in some African countries, as many as 70 percent of those with high blood pressure are not aware of their condition. As a result, it very often goes undiagnosed and untreated. In that respect, Agyemang was an exception to the rule. Many stroke patients never even know they have blood pressure problems until they suddenly pass out and wake up in the hospital. "They don't see themselves at risk," Sarfo says. "They think they're fine, and then all of a sudden, the pressure goes up, the blood vessel bursts and then they have a stroke." Barango adds that WHO is helping to train health care workers, especially in rural areas, to routinely look for signs of high blood pressure. And, he says, health professionals need better access to the right tools. "You would be surprised how many health-care facilities don't have a functioning blood pressure gauge," he says. "The solution starts at the rural and primary health care level." In addition to the lack of awareness, Ghanaians face other obstacles to effective hypertension treatment. The medicine can be costly, in a country where average annual income is about $1,400. And it must be taken for life, whereas many people are accustomed to treating diseases that resolve over time. Once the problem escalates to a stroke, the cost becomes even higher, from CT scans in the emergency room to months or years of physical therapy and rehabilitation, during which time many, like Agyemang, are unable to return to work. "For us within Africa, we need to focus mainly on prevention of stroke, because it's quite challenging to manage" once it happens, Sarfo says. To that end, Sarfo recommends at-risk people eat more leafy green vegetables, stop smoking, exercise more and, of course, take their blood pressure medicine as prescribed. He and his fellow researchers are developing a smartphone app for people with hypertension that can read their blood pressure and send reminders to take their pills. Agyemang says he has learned his lesson and is working hard on his rehab regimen so he can get back onstage. "I'm rehearsing," he says. "I have a passion for singing, so I want to continue once I recover."